Jack is a special little guy who gets by on his charm and good looks! Jack was originally found about 3 years ago, wandering a highway in Alabama. He was covered in deep wounds, had a scratched cornea, and an empty right eye socket. It was clear that someone or something had torn him up pretty badly. He was fortunate enough to get away from whatever bad situation caused his pain and was found by someone who cared enough to help him. 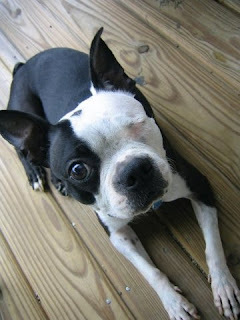 The nice person who found him took him to a vet where he was cleaned up, stitched up and given a permanent wink! When Jack recovered, he was adopted by a wonderful family in New York who took great care of him for about two and a half years. Unfortunately, Jack's rough past led him to develop some fear and aggression toward other dogs, especially other males. He didn't get along at all with the other male dog in his new family, which caused a lot of stress and conflict. So his new family made the decision to find him a new forever home where he would be the only child and he would get all of the attention. 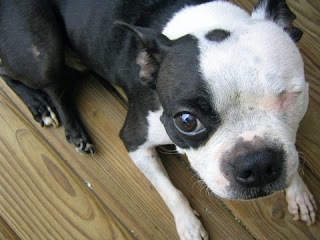 That's when Erin O'Connor and her boyfriend, Ray Wildman, found him through the Boston Terrier Resource and Adoption Center on Petfinder.com. They were looking for a Boston Terrier to provide them with companionship and an excuse to get more exercise! 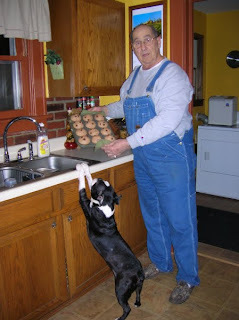 Jack won them over instantly and they decided to apply to adopt him in February of 2009. 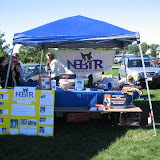 NEBTR assisted by sending a representative to perform the home visit required for Jack's adoption. Erin and Ray were happy to welcome Jack into their home as the latest member of their family. He was very friendly with everyone he met and seemed very happy in his new home. However, they soon discovered that poor Jack was more affected by his past then they thought. One day, when Jack's new parents were at work, a thunderstorm rolled through. Erin came home after work and discovered bloody shards of wood all around the inside of the doorway. Jack was so frightened while he was alone that he chewed off almost all of the molding beneath the doorknob on the front door. He started becoming progressively more and more anxious while Erin and Ray got ready to leave for work every day. He would shake and whine uncontrollably when he knew they were about to leave. Then Jack just became nervous and anxious almost constantly. Whenever he was left alone while there were loud noises like fireworks or thunder, he would become destructive. He pushed out a screen in a second story window and even chewed a hole almost all the way through a door! It was clear that Jack had a severe noise phobia and also developed separation anxiety. Even though Jack turned out to be a bit of a special needs dog and required serious dedication, Erin and Ray decided to put the energy and time into helping Jack overcome his anxiety. With the help of a dog behavior specialist, they began using a combination of anxiety medication, training, exercise, and behavior modification techniques to rehabilitate Jack. The time and patience that Jack's new parents have given him have made a big difference. He still has a way to go, but his stress level has decreased drastically and he is a much calmer dog. He continues to show improvement in his behavior and discipline. After all of the hardships Jack has endured, he is finally happy to settle into his new forever home where a loving family is willing to give him the attention he needs to be happy and calm. Jack wouldn't be the same without the kindness of so many people! Over the past year, we have taken in many dogs whose owners are unemployed, whose homes are in foreclosure, who have taken jobs at lower wages, or who have been forced to work longer hours to make up for absent co-workers. Many people are moving into apartments or in with their parents or other relatives, and their dogs are not welcome. We wanted to point out a few resources for those who must rehome themselves and their pets. The first is a site that helps people find rental housing that allows pets: My New Place. For some excellent advice on changing minds and presenting a good case for your well-behaved and healthy dog, see the Humane Society of the United States site. For property managers and rental property owners, we would like to put in a good word for responsible pet owners everywhere. Somewhere around fifty per cent of US households own pets; think of how many more potential applicants you'll have with a careful pet policy in place! Property owners, you are ultimately the decision makers on this issue. Please consider allowing pets whose owners can provide clear evidence of commitment to their pets: references from previous rentals; a letter from a vet indicating their pets are spayed/neutered and up to date on vaccines/titres and yearly exams; a letter from the president of a homeowners' organization; willingness to pay a deposit or slightly higher rent for the privilege of a pet-friendly home; even a letter from an obedience class instructor. All these can be evidence that your potential renter is not just a responsible pet owner--she's a responsible person, and she'll take good care of your property. Finally, please remember that a great many people have lost a great deal in the past two years; must they lose their pets as well? Our hearts go out to those whose lives continue to be wrenched out of shape by circumstances beyond their control. If you are being forced into an apartment or rental, please start looking for a pet-friendly home as soon as you can. Many local shelters have lists of pet-friendly apartments. Ask friends and colleagues for recommendations and suggestions. The competition for housing that allows pets can be stiff, so be creative, assertive and positive when it comes to finding a new place for yourself and your family. As it turns out my" BOSCO" has become a special needs dog ...He told me yesterday he needs a new blanket on his end of the sofa . He also told me he needs some new squeeky toys . and a new soccar ball for the back yard . He said six am: was to early to get up and go pee pee ...that eight am : was better . He also said he needed to try some other treats . He said he needed a new collar with matching leash . He said he needed more rides in the car . He also needs more time in the park . He needs new winter booties. He needs a new hoodie. Let me tell you folks these special needs fur kids need a lot lovin . Please spread the word, it is meant to give these dogs their best shot at a forever home. I have several rescues and shelters already including it in their adoption packets. Also let other rescue people know that if they have any questions or wish to have a workshop on these issues, we would be happy to arrange that either here or somewhere else. Heard from Victoria "our" little Quigs is doing well. Soooo Happy to hear. Use that article with my sincere hopes that the more people reading this.... the better chance everyone has of getting these dogs placed permanently. Press 1 if you have a 10-year-old dog and your 15-year-old son has Suddenly become allergic and you need to find the dog a new home Right away. Press 2 if you are moving today and need to immediately place your 150 pound, 8-year-old dog. Press 3 if you have three dogs, had a baby and want to get rid of Your dogs because you are the only person in the world to have a Baby and dogs at the same time. Press 4 if you just got a brand new puppy and your old dog is having Problems adjusting so you want to get rid of the old one right away. Press 5 if your little puppy has grown up and is no longer small and Cute and you want to trade it in for a new model. Press 6 if you want an unpaid volunteer to come to your home TODAY And pick up the dog you no longer want. Press 7 if you have been feeding and caring for a "stray" for the last three years, are moving and suddenly determine it's not your Dog. Press 8 if your dog is sick and needs a vet but you need the money For your vacation. Press 9 if you are elderly and want to adopt a cute puppy who is not Active and is going to outlive you. Press 10 if your relative has died and you don't want to care for Their elderly dog because it doesn't fit your lifestyle. Press 14 if you are calling at 6 a.m. To make sure you wake me up Before I have to go to work so you can drop a dog off on your way to work. Press 15 to leave us an anonymous garbled message, letting us know You have left a dog in our yard in the middle of January, which is In fact, better than just leaving the dog with no message. Press 16 if you are going to get angry because we are not going to take your dog that you have had for fifteen years, because it is not our responsibility. Press 17 if you are going to threaten to take your ten year old dog To be euthanized because I won't take it. Press 18 if you're going to get angry because the volunteers had the audacity to go on vacation and leave the dogs in care of a trusted Volunteer who is not authorized to take your personal pet. Press 19 if you want one of our PERFECTLY trained, housebroken, kid and cat friendly purebred dogs that we have an abundance of. Press 20 if you want us to take your dog that has a slight aggression problem, I.e. Has only bitten a few people and killed your neighbor's' cats. Press 21 if you have already called once and been told we don't take personal surrenders but thought you would get a different person this time with a different answer. Press 22 if you want us to use space that would go to a stray tobBoard your personal dog while you are on vacation, free of charge, of course. Press 23 if it is Christmas Eve or Easter morning and you want me to deliver an eight week old puppy to your house by 6:30 am before your kids wake up. Press 24 if you have bought your children a duckling, chick or baby Bunny for Easter and it is now Christmas and no longer cute. Press 25 if you want us to take your female dog who has already had ten litters, but we can't spay her because she is pregnant again and it is against your religion. Press 26 if you're lying to make one of our younger volunteers feel bad and take your personal pet off your hands. Press 27 if your cat is biting and not using the litter box because it is declawed, but you are not willing to accept the responsibility that the cat's behavior is altered because of your nice furniture. Press 28 if your two year old male dog is marking all over your house but you just haven't gotten around to having him neutered. Press 29 if you previously had an outdoor only dog and are calling because she is suddenly pregnant. Press 30 if you have done "everything" to housebreak your dog and have had no success but you don't want to crate the dog because it is cruel. Press 31 if you didn't listen to the message asking for an evening phone number and you left your work number when all volunteers are also working and you are angry because no one called you back. Press 32 if you need a puppy immediately and cannot wait because today is your daughter's birthday and you forgot when she was born. Press 33 if your dog's coat doesn't match your new furniture and you need a different color or breed. Press 34 if your new love doesn't like your dog and you are too stupid to get rid of the new friend (who will dump you in the next month anyway) instead of the dog. while the vet mercifully frees him from the grief of missing his family. We adopted him (from the Katrina disaster) when we lived in Waynesboro, PA. As we both guessed...Stormy has had a big bag of issues but we are pleased he has come so far. He had the issue with biting the leash for such a long time. When I finally realized he has an anxiety disorder and has panic attacks my plan changed. Every morning after his breakfast he walks on a leash with me. He goes up to the door and waits for me to put it on him. It works better with me putting it on inside the house rather than outside. After his walk he goes directly to the treat bowl and the treat is given immediately. If his schedule changes he has problems but is learning to adapt better. He has become deaf or hard of hearing and isn't able to respond to voice commands. He follows me around everywhere and when I leave I must ALWAYS let him see her leaving. If not he runs all over the house frantically looking for me and has panic attacks. He has never given good eye contact but will hold his head down and wait for his clue to eat. If we are able to get a little eye contact it is like a side glance. Now he has very bad cataracts but before they deteriorated he was the same. He has become so much more affectionate and LOVES to have his back and head rubbed. He has a strange way of playing with his toy but it is his game so he makes the rules. We throw the toy and he runs to get it (giving it the old Boston shake) but doesn't bring it back. We go to him, pick him up and wait until he releases it the throw again. He just loves his "fetch" game. After we realized we have a neurotic dog we just decided to accept his "handicap" and enjoy him. His panic attacks are so terrible and I do not want to use medication for them so the way I have chosen seems to work for him ok. Several concerns about having cataract surgery for him. The nearest vet that does that is in Birmingham and that is over 4 hrs away from me. The dog is left at the vet the day before and also the night of the surgery stays overnite at vet. Honestly, when weighing everything, I am not sure he could handle that. The next thing, as you know, is the collar for 3 wks. Stormy could end up being so traumatized that the surgery procedure could be worse than the problem with cataracts. He still seems to see quite a bit and I am using the ocluvet eye meds on him. He doesn't mind the meds and I started using it some months ago. I was a sign language interpreter for years so the deafness is not as difficult for me to deal with. I know to get in front of him and not come from behind and frighten him. When I leave the area of the house where he is, I will gently nudge him from his sleep so he will know I am moving to a different area in the house and he will follow me. I have gone out of town in the past and left him with John and he runs all over the house looking for me again and again and will get very depressed. Yesterday we took all the dogs in the car with us for a short errand and he had his panic attack. Even when he goes in the car almost every day he always panics and it last a long time. That is the situation. I would just hate to put him on medication that would cause him to be a zombie. He has come so far since we first got him. We love Stormy and he loves us and we feel our home is the best for him. There are so many people who survived Katrina, only to have nightmares still. But they can talk it through with others. Stormy can't. We love him so much and want him to feel safe with us but he obviously has been so traumatized from the Katrina disaster he may never recover completely.